Yesterday was another good day off. The plan was to not go anywhere and hopefully get some cleaning done. I did manage to do some cleaning, got the laundry done and then thought it was time to change out the decorations on my dining room table. It was too wintry and I'm ready to move on even if Mother Nature isn't. Since Valentines Day is fast approaching I dug in my seasonal decor cabinet to see what I could find. 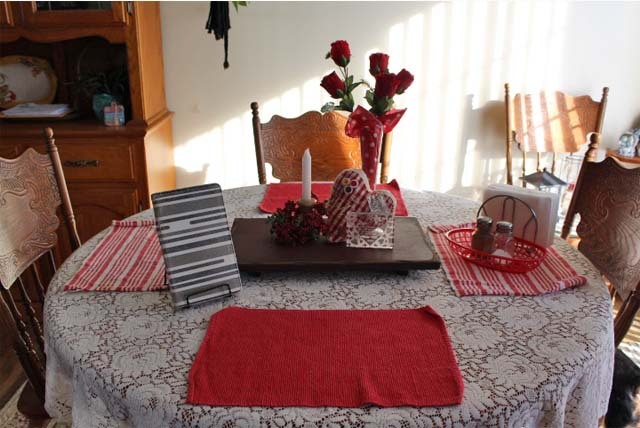 I started with a lace tablecloth and the solid red and red and white striped place mats. I pulled out the vase and some fake roses, a little candle holder with a red berry ring, a stuffed heart that has some machine embroidery on it and a crystal block that Wade had given me for Valentines day in 2006. I also added the little red plastic basket to hold my salt and pepper shakers. On the left you see my kindle in a small easel. I like to read while I eat my dinner but don't want to have to hold the kindle. The easel is the perfect solution. I put the crystal block up against one of the place mats so you can read what it says. I remember he thinking it was a silly gift when he gave it to me but I thought it was far from silly. This year I would even go as far as saying it's priceless. On a side note, I did end up going to my daughters house for a bit and on the way home I noticed the temp was 36 degrees. It's funny how after having such cold temperatures 36 felt almost warm. What a treasure this crystal is!!! Your table looks lovely. A little but country, and lots of heart! I actually forgot I had the crystal. I agree that's a wonderful gift from Wade. Very touching. These are the things hubby does for me all the time. 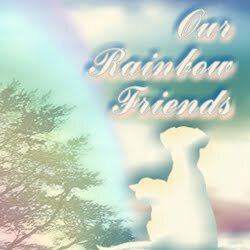 They are very special as this is to you. A lovely gift, then and now. Really special. That is an oh so lovely gift from Wade. So much love in the sentiment. You are right, it is 'priceless'. Your table looks lovely and that gift from Wade is so special. 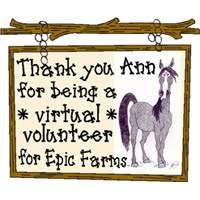 What a wonderful keepsake to have! The table looks so cute and I love the crystal block from Wade. Good for you! I'm so glad you found the crystal block. PS This post brought tears to my eyes. This is so pretty! And that crystal is a treasure! I can comment again! Yay! I don't know what was wrong - I haven't done anything different. Thanks. Glad you are able to comment again. I'm sure that whatever the problem was it had something to do with blogger. 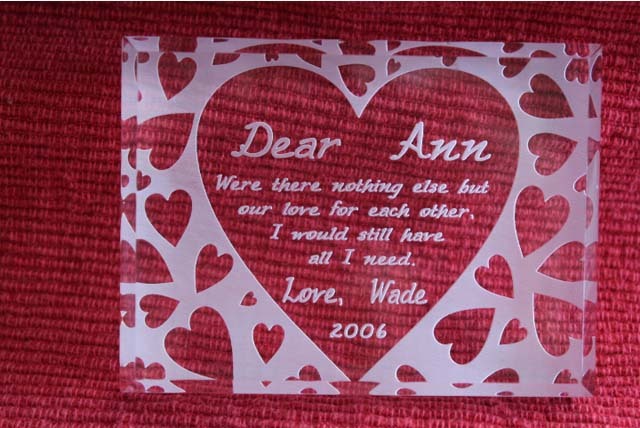 What an awesome saying on the crystal gift that Wade gave you. Very, very nice. I made myself get out today. It was so pretty and I needed a break from the furbabes. Problem is I seem to find that I get emotional when I get out. Hoping that changes soon. That's what I thought too, it was perfect for the table with all the other stuff I put out. 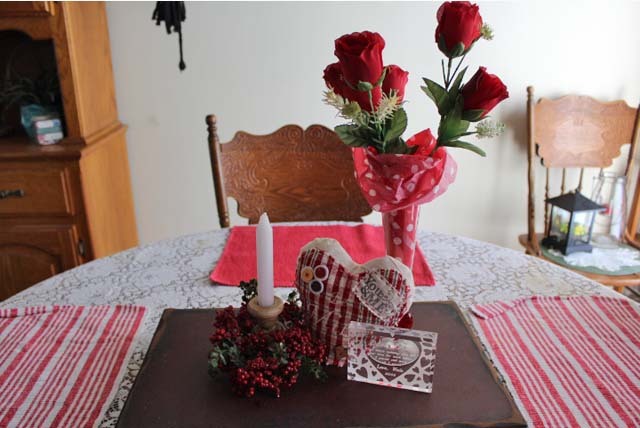 It's looking very "Valentinish" at your home. That little crystal block is a perfect remembrance of a moment in time--and yet has a long-lasting reach. We have freezing rain here this morning-schools delayed by 2 hours and I am not going in to work until about that time either. ugh. I.DO.NOT.LIKE.WINTER!!!! OH, how precious is the crystal from Wade. A treasure to you. Your table looks lovely too. We have a warming trend and then freezing cold. Not very many people agree with me but I do hope we have at least some real snow. I feel cheated with a winter cold and no snow. Weird, I know.